3 Bedroom Semi Detached House For Sale in Cheltenham for Guide Price £405,000. 5 Hewlett Place is a beautifully designed newly constructed home by H&H Developments. One of just four 2 & 3 bedroom semi-detached town houses with a traditional exterior and contemporary styled interior. 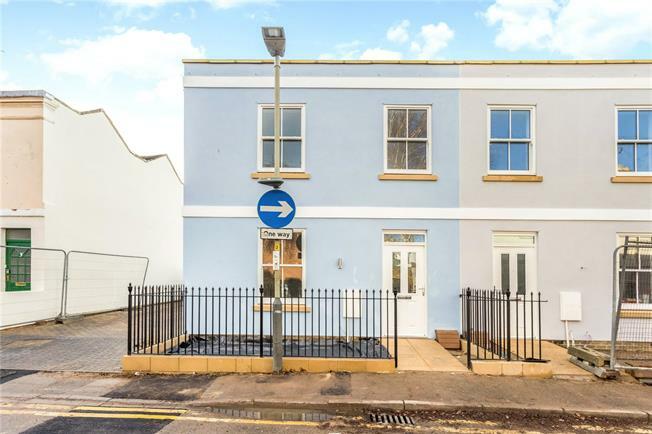 Tucked away on Hewlett Place between Priory Street and Hewlett Road and with a inner courtyard to the rear with off road parking, the location is extremely convient being a short walk to amenities and the town centre. The spacious accommodation offers well proportioned rooms arranged over two floors with the advantage of three generous bedrooms and two bath/shower rooms as well as a living/dining room with doors to the rear garden, kitchen and cloakroom. The specifications of each house have been carefully considered and offer a a stylish and practical selection of fixtures and fittings as well as the advantage of having floor coverings included. The Howdens contemporary handleless kitchen is dove grey with soft close doors and white mirror chip quartz work surfaces. Integral appliances include a Bosch oven and hob with an extractor hood over. Fridge/freezer, dishwasher and washer/ dryer with a stainless steel sink with mixer tap. Comprise Duravit bathroom furniture with attractive light coloured ceramic tiles, Hansgrohe mixer taps and showers matching floor covering. Light Oak effect flooring on ground floor and carpets on stairs, landing and bedrooms. USB points in every room, BT connection, duct for Virgin. Chrome downlighting. Agents note: Photographs are of No 4 Hewlett Place. 1 Parking space with opportunity to purchase a 2nd space.